Renzo Piano’s Broad Contemporary Art Museum may find itself with new neighbors on the LACMA campus, thanks to Peter Zumthor. Peter Zumthor is cooking up something big for Los Angeles. The Swiss architect, winner of this year’s Pritzker Prize, and designer of well-received art museums in Switzerland, Austria, and Germany has been visiting LA this year to look at the Los Angeles County Museum of Art. LACMA’s seven buildings—mainly from the 1960s and ’80s—spread disjointedly over 20 acres, and the museum has sought a more distinguished home for years even as it has expanded toward Wilshire Boulevard. Three years ago, Michael Govan, when he became LACMA’s CEO and director, said this creative, forward-looking city is the only one in the world today with the chance to redo its major museum. Govan’s plan to tell new stories of the histories and meaning of art would be bolstered by new architecture. 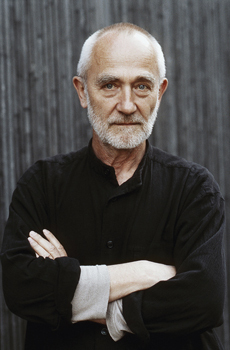 To that end, Govan has been working with many talented architects, including Culver City–based SPF:a and Renzo Piano, but none are more idiosyncratic than the man from Haldenstein, Switzerland, Peter Zumthor. On a recent trip to LA, Edward Lifson sat down to interview the often reclusive-seeming architect. He followed up with an interview with Michael Govan, and found, to his surprise, that just when it felt like visions for major cultural projects across America were on hold, there are still some very ambitious long-term plans in the works. Edward Lifson: You only accept commissions that deeply interest you. Why accept the transformation of LACMA? 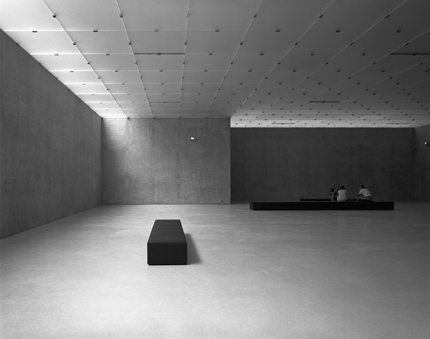 Peter Zumthor: Well, I knew Michael [Govan] from New York, from the Dia Foundation. We tried to do a project there for the artist Walter de Maria. After Michael took over in LA, he called me and said, “Look at this collection! We have to start to think about a new building for this.” I started last April. With a large team from LACMA, we’re thinking about this campus and about what a new building for the entire collection could be like. It probably won’t be a sequence of period galleries with a long corridor. We’re talking about rebuilding the whole east part of this campus from the two new Renzo Piano buildings all the way over to the tar pits. The prehistoric La Brea tar pits next to LACMA. For your baths at Vals in Switzerland, you used the local primordial stone. What will the materials be here? Will we see tar in this project? [Laughing] I don’t know yet what the materials would be. Well, since the museum has a beautiful collection with nice anchor pieces of pre-Columbian art there is a proximity to the old history of the continent, and it would be nice to integrate the proximity of the tar pits into the new project. But we’re designing from the inside out, that’s the most important thing. The personality and the character of the collection is what’s interesting. You know, every collection has a different personality. We want to bring out the character of this one. We’ll identify five or six anchor pieces of art for the building. Pre-Columbian and Indian art are very strong here and, of course, one anchor in this place, Los Angeles, will be cinema. Around the anchor pieces we’ll leave space for interesting juxtapositions with other art—more of the same or completely different art—which somehow has to do with it. zumthor’s Kunsthaus Bregenz, Vorarlberger Landesgalerie, Bregenz, Austria (1997). There will also be space for atmospheres. We’re talking about building into the architecture a critical thread. A dark space. A line going through the museum in which you can make critical commentaries on the art, by using photography, film, drawing, etc. So a complex cellular idea starts to develop in my mind—and I have no damn idea of what this will be architecturally! I know about the “architectural tissue” for the building, but I have no idea how this could be done in real architecture! Michael knows I need two to three years to come up with the solutions, and this is a ten-year project. But when he approaches funders they’ll want to see drawings in half a year at the latest. So we’re starting now so that when he’s ready to go to funders, we’ll be prepared. Also, we should think about conservation and storage and all that, and of course those people should get a presence in the building. And then Michael says things like, “It has to appeal to children! It would be a great thing if a million children came to visit, maybe two million!” Nobody in Europe would ever talk about that. I think a very interesting part will be the early American art, colonial art—it’s filled with lies. So we’ll have to introduce contemporary art, such as film and so on to comment on it, because the whole thing has to be true. And I think I would like to talk about when American art became a part of the world in the 1960s in a big way, and many of these artists were Californians. So it’s fascinating and exciting. In the end, it could have intellectual and emotional parts—to make relationships across different kinds of art. Endless cross-relationships, like Los Angeles itself. How will you connect with the city architecturally? The way the current buildings hardly relate to Wilshire Boulevard, this kind of contrast, I think, is very American. I’m not fighting it at the moment, I’m just absorbing it. But we would maybe try to offer something not so well-known in Los Angeles, which is public space. With open-air cinema and so on, we’d like to make the whole place open to the people. Michael and I have the feeling that all of Los Angeles is waiting for some real public space. When you look around the existing museum campus of LACMA for inspiration, what do you see? Typical American themes, you know, everybody has made a piece, not looking left and right: “I do this, I do that, and tomorrow I do this and then I do this.” As a European, I’m trained more to say, “Maybe, could we maybe do a whole of the place? Maybe more than a collection of singularities?” I take pleasure in that, and we laugh a lot. I’m sorry to say, but today what they have here are strange buildings that clog up any public spaces. It’s a little bit of a mess now on this site, so we’re trying to think, how could we get rid of this? Your project will involve demolition of existing LACMA buildings? Others have tried to redesign this campus and failed, notably Rem Koolhaas. How will you avoid failure? It’s one thing for you to build in Switzerland, Austria, or Germany, but here you are in Los Angeles, which is so different! Maybe I’m too naive. I’m always like a little boy, getting excited. I look at this project and I get excited, I think I can do it. I’m aware you have to learn, but it’s not so different from Switzerland or Norway. It’s a small world. I was here in the ’80s teaching at SCI-Arc, and to my surprise I got to like LA. It felt good. The city didn’t give me the feeling, “You don’t understand me, go home!” And so I’ve come back. When Michael called me I had the same feeling: I can work there. What, specific to Los Angeles, are you drawing on for inspiration for this project? I’m coming now from the snow and the cold in Switzerland, so this eternal good climate. Here it’s light and serene, and lush vegetation. Yesterday, we went to the Huntington Gardens; it’s incredible. I’ve been looking at the John Lautner houses and Frank Lloyd Wright houses, all that. For me it’s something easy, something I like. There are formal aspects of life here, but they are maybe not as stiff as in other areas of the world. Los Angeles has a steady pace and flow. Michael Govan: It’s pretty clear that over time we’ll need to do something major with our old campus. In the old buildings, the systems are old and [today there are] different earthquake standards and all that. And you know obviously Rem [Koolhaas] proposed an interesting scheme for that process, and Renzo [Piano] has proposed some ideas as well. For me, I had worked with Peter Zumthor before, and he’s just one of the great architects of architectural history and so I was really interested in working with him to get his take on what might be accomplished if you really took a big, long view of the park and the museum. You’re catching us in the earliest phases of thinking. I mean, right now we’re spending time looking at gardens. The other day we walked through the Huntington Gardens looking at all kinds of palm trees. In other words, we’re soaking up ambiance and ideas. Zumthor knows LA; he taught here at SCI-Arc in the 1980s. But unlike [architecture writer] Reyner Banham, I don’t think Peter Zumthor had a car here, I think he rode his bicycle. This time we’re driving him around, and I don’t know what Peter will come up with for us—and one thing I’ve learned is to never predict what he will come up with. We shouldn’t predict because we’d lose the whole pleasure of finding out. I’d rather savor that. We can’t even assume we’ll have Zumthor design one big building. We may keep some of what we have, restore them a bit, keep history, you know? Obviously the Bruce Goff with Bart Prince [Pavilion for Japanese Art] is a real keeper. Everybody agrees on that. We have property across Wilshire too, so it’s just been a totally creative situation. But one thing I think makes a lot of sense is to create indoor/outdoor space. We’re trying to emphasize the park and the outdoor spaces more, and I think you’ll see that as part of it, something uniquely Los Angeles. We’re already trying to create a more LA-looking place. With symbols and icons and things that people would recognize as Los Angeles, instead of being a copy of someplace else. We’d like to more fully embrace the [adjacent] Natural History museum and the tar pits. It’s a folly; it’s an artistic folly in its own right. A magnet for families and visitors that talks about the locality. And in a down economy, when there aren’t millions and billions for building, it’s a very good time to spend time thinking. As you know, if you know Peter’s work, the design time is fairly long anyway. How do you avoid failure this time? What can you do to make sure you get something built by Zumthor here? I wouldn’t say Rem failed, I think it was a brilliant scheme. But I’m not sure LACMA was ready for Rem’s huge project at that time. I’ve proposed to the board a more incremental, longer-term plan. If I were to have my way, I’d like to see the whole campus transformed, edge to edge, over about fifteen years. What does the board think of Peter Zumthor for this project? Well, after he won the Pritzker Prize, everybody thought I was brilliant!